Robotech was a great show which aired back in the 80's. Here's is an Alpha Fighter design. Pretend you're in the cockpit :) Believe it or not, I went through over 100 layers for this design (many of which I ended up altering or throwing away, however). Well, Vicky Pratt, who plays the role of Sarge onthe show Cleopatra 2525 had her chance to do a little 'dance' for us, similar to Jennifer Sky's. This design is done in a similar fashion as well. A new sci fi show started up two weeks ago and I've gotten into it! Cleopatra 2525. Here is Creegan, a villain of the show. He looks very cool, apparently a ripoff of Brom's work? 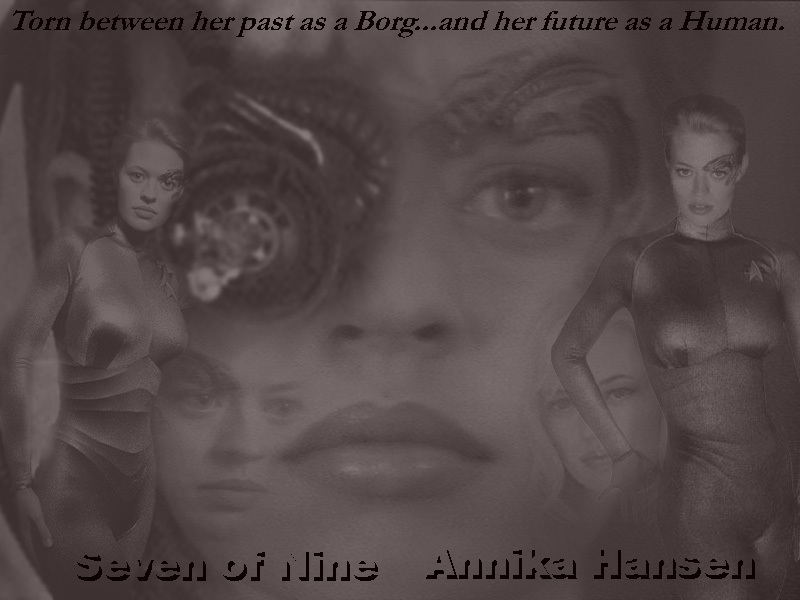 Seven of Nine (Borg designation) or Annika Hansen (Human name)? Here is the second version (92k) of the same design, since I didn't know which one fit better. I'll let you decide for yourself. My first Photoshop picture. It's Buffy! Considering this is my very first Photoshop image, I'm extremely impressed with the results. I do wish, though, that the top right corner could have been blended together better. Sorry the image is so small.